Laura Bridgman: The first deaf-blind person to be successfully educated before her teacher abandoned her. She was Helen Keller before Helen Keller. Then her mentor abandoned their studies. Excerpted from the book For the Benefit of Those Who See: Dispatches From the World of the Blind by Rosemary Mahoney, out now from Little, Brown and Company. Very few people today seem to know who Laura Bridgman was. But in her day, she was considered the most famous woman in the world other than Queen Victoria. She was a Helen Keller before Helen Keller—but, abandoned by her mentor, she died in obscurity. Amid the general mood of progressive humanitarian social reform that was sweeping New England at the time, the Massachusetts legislature voted in 1829 to establish the New England Asylum for the Blind—the first school for the blind in the United States, with Samuel Gridley Howe as its director. In her biography, The Imprisoned Guest, Elisabeth Gitter has given an in-depth portrait of Howe, a man who was described by many as arrogant, vain, prideful, competitive, quick-tempered, defensive, overbearing, hungry for glory, a shrewd publicist and promoter, and generally unlikable. Howe’s wife, the long-suffering Julia Ward Howe, stated that her husband was “incapable of enduring criticism or of profiting by it” and was also “much led by flattery.” Charles Dickens called Howe a “cold-blooded fellow.” Nevertheless, Howe was intelligent, determined, and had a genuine sense of empathy for the disadvantaged. Howe’s ambition for both himself and the Asylum for the Blind laid the foundation for what would become the world-famous Perkins Institution. Laura Bridgman was, as far as the records show, the first deaf-blind person to be successfully educated. Born in 1829 on a rural farm in Hanover, New Hampshire, she was, by her mother’s account, a lively, intelligent, extremely curious child who had at 18 months begun to “talk quite plain” and learn a few letters of the alphabet. But when she was 2, she suffered a bout of scarlet fever that left her blind, deaf, and nearly devoid of the senses of taste and smell. Within a year, she had forgotten how to speak. (Her mother claimed that for a while after her illness, Laura repeated the words “dark, dark” in puzzlement at her inability to see.) Laura was left with no form of communication other than crude gestures, and her early childhood resembled Helen Keller’s in scope and emotion. When Samuel Gridley Howe heard Laura’s story, he saw in her an opportunity to experiment with the ongoing question of whether a blind-deaf child could be taught. A child unexposed to sensory information, experiences, and ideas from the external world would provide Howe with an opportunity to study what in the human mind is innate and what is learned, the old Enlightenment question that still had not been answered entirely. In 1837, when Laura was 7 years old, Howe persuaded Bridgman’s parents to let him take her to his asylum in Boston, and after working intensively with her for several months, he succeeded in making her understand the meaning and reason of language. Howe and the teachers he employed at Perkins taught Laura the manual alphabet of Charles de l’Épée. For a blind-deaf person such as Bridgman, the letters of the alphabet were formed with the fingers and pressed into the palm of the “listener’s” hand. With Howe’s writings about Laura and his frequent public exhibitions of her remarkable linguistic capabilities, the pair quickly captured the public imagination. In the 1840s, Howe’s annual reports from the Perkins Institution—including private remarks that Laura made to her teachers as well as intimate details of her personal habits, her fastidiousness, her desire for affection and approbation—were in demand all over the United States and Europe. Newspapers and magazines began regularly printing sensational articles about the girl. A savvy publicist, Howe knew that the notoriety was good for the future of his school and used his storytelling ability to emphasize Bridgman’s most admirable qualities—purity, sincerity, patience, determination—and thus appeal to the sentiments of his readers. On his 1842 tour of America, Charles Dickens visited the Perkins Institution and was, not surprisingly, deeply moved by his meeting with Laura Bridgman. Hers was a case that would have fit ideally into one of his own novels. In his American Notes for General Circulation, Dickens quoted Howe’s annual reports. Upon publication of American Notes, Laura Bridgman’s fame exploded—hundreds of thousands of people on both sides of the Atlantic came to know and marvel at her story. Laura Bridgman became what the public wanted: an idealized, sentimentalized symbol of suffering tempered by goodness and hard work. She was an example of the power of the human spirit to overcome adversity. She was also a novelty in an age newly fascinated by celebrities and curiosities, a trend fostered and fueled by the advent of the high-speed printing press. The real Laura Bridgman was both more interesting and less angelic than Howe and Dickens led the public to believe. She was intelligent and had a very strong will, which at times she refused to curb to suit what Howe and the other teachers wanted of her. When she was instructed not to make loud and “disagreeable” noises with her unmodulated voice, she responded, “God gave me much voice!” She occasionally deceived her adult teachers; several times stole food from other students; sometimes pushed, pinched, and bit people; and could be irritable, moody, and selfish. She was contemptuous of students who seemed to lack intelligence, and she treated them imperiously. She was emotionally needy, had fits of nerves, and in her late teens became anorexic. She was, then, not unlike a lot of teenagers. When Laura was 11, Howe conceived of an experiment to isolate her from all religious ideas in an effort to determine whether notions of God came naturally to human beings or were instilled by others. He instructed her teachers to deflect any questions she had about God and religion. Inevitably exposed to religious notions through her contact with the other students, and having discovered the Bible in the Perkins Institution library, Laura was already inordinately curious about the subject. Soon after Howe devised this scheme, he married Julia Ward, and they went abroad for 18 months on their honeymoon. He was not present to oversee his own religious experiment with the girl, and he left her feeling utterly abandoned. Laura’s mother—the only other person of extreme importance to her —was busy with five other children and the household demands of a farmer’s wife and so had stopped responding to Laura’s letters. At age 14, Laura was left to the care of a gifted but not exceptionally affectionate teacher, Mary Swift. As an evangelical Christian, Swift found it difficult to accept Howe’s ban on religious instruction, particularly in the face of Laura’s persistent question, “Why can I not know?” When a group of orthodox evangelical Christians came to the school, they ignored the request to refrain from religious discussion and gave Laura what amounted to a crash course in their beliefs. When Howe returned to Perkins and found Laura, who was no longer a child but a teenager, spouting evangelical dogma, he declared publicly that his project had been contaminated by “ignorant and selfish persons” and was therefore ruined. The blank slate that Laura had provided had been scrawled upon by interlopers. With his project soured, disillusioned by both his own failure and Laura’s glaring and seemingly sudden faults, he effectively turned against her. After years of pouring praise on her for the public’s consumption, he now stated that his hopes for her had been disappointed “clearly because they were unreasonable.” In short, Howe maintained that Laura’s flawed genetic inheritance and physical handicaps had warped her character and left her mentally and even intellectually defective. Howe had stated firmly at the start of his career that the blind were no different from the sighted and that blindness was a superficial handicap, but after 10 years of work at the Perkins Institution, he radically reversed his position. In his Sixteenth Annual Report, he claimed that his views had been modified by experience. He stated in emphatic uppercase letters: “THE BLIND, AS A CLASS, ARE INFERIOR TO OTHER PERSONS IN MENTAL POWER AND ABILITY.” Contradicting in the extreme many of his earlier statements, Howe went on to insist that the senses, especially sight, are crucial to the development of the mind, and that people who were born blind, or became blind due to illness, were victims of poor heredity that left them inferior both mentally and physically. 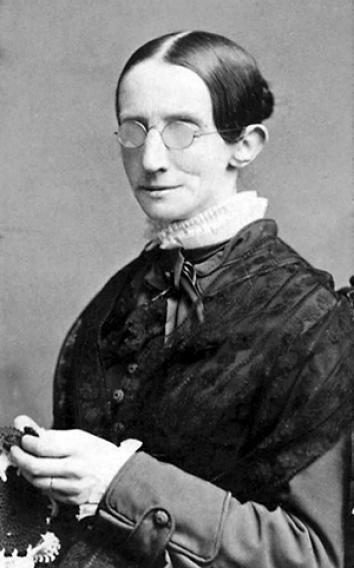 Toward the end of her life, Annie Sullivan stated that she had “always believed Laura Bridgman to be intellectually superior to Helen Keller.” Keller herself said that if Bridgman had had Sullivan as a teacher, “she would have outshone me.” Yet despite her remarkable intellect, following her brief period of celebrity, Laura Bridgman lived out the rest of her years in obscurity, abandoned by her teacher and by society, a lifelong resident of the Perkins Institution, monotonously doing needlework and reading embossed books, a shut-in no less than she had been as a child on the farm in rural New Hampshire. Excerpted from the book For the Benefit of Those Who See: Dispatches From the World of the Blind by Rosemary Mahoney. Copyright © 2014 by Rosemary Mahoney. Reprinted with permission of Little, Brown and Company. All rights reserved.